Reading headlines like “Germany’s nuclear cutback is darkening European skies” makes Craig Morris despair over the state of journalism. You may have heard that Paris is suffering from so much air pollution that the city recently topped the world charts, even beating out Chinese cities. 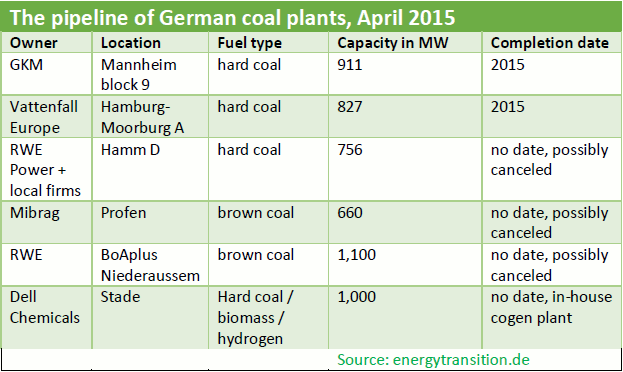 But did you know that the surge in German coal power during its nuclear phaseout is the reason? That, at least, is what Michael McDonald of OilPrice.com (republished at Time.com) would have us believe. But there are a few problems with this story. First, though McDonald says “the renewed German penchant for coal power” may be behind the air pollution in France, only Paris is suffering from smog. Strasbourg, a French city directly on the German border, has no such problems, nor does the large part of France between Paris and Germany. In fact, no other part of Europe is complaining of smog. Miraculously, the smoke from German coal power apparently travels through a funnel directly to Parisians – even when the wind is blowing from France to Germany. Second, there has been no surge in coal power during the nuclear phase-out. In fact, total coal power production (both lignite and hard coal) fell by six percent last year alone. If German coal power is polluting Parisian air, the problem should be getting smaller. The growth of renewable electricity has outstripped the reduction in nuclear power. Finally, the journalist also believes that “numerous new [coal] plants are scheduled to come online in the next few years.” Tellingly, he does not provide a specific number or a link to a source – yet, the number is knowable. The two plants to be completed this year already started producing electricity this year and will therefore not “come online in the next few years.” Neither was a reaction to the nuclear phaseout of 2011; the Moorburg plant was first proposed in 2004, Mannheim in 2007. Two weeks after the BDEW updated the list above, Mibrag announced that it was stepping away (report in German) from the Profen project entirely. A fourth project, Hamm D, should already be online, but various acids entered the boiler, and the plant has been delayed indefinitely. The latest word (report in German) is that the plant “may never generate electricity” because German utilities began building too many plants 10 years ago. The fifth plant, RWE’s BoAplus Niederaussem, is especially interesting in this respect. Utility RWE believes the 1.1 gigawatt plant, which was originally to be completed by 2020, might be needed to replace around seven gigawatts from a variety of sources that will be shut down in the area by 2025 (none of which are nuclear). If built, it will be the first to have been planned completely after the Fukushima accident and Germany’s nuclear phase-out; the plant was first proposed in October 2011. It has not yet officially been canceled, though the local press says “it is extremely unlikely that the plant will ever be built” (report in German). Once again, money is the problem. Under current wholesale prices at less than three cents, new coal plants just aren’t profitable. Which brings us to the last plant on the list: Dow Chemicals plans to set up a cogeneration plant at its facilities outside Hamburg. Though it will partly run on hard coal, the plant will produce more process heat than electricity. It is being built to provide in-house electricity and heat not as a reaction to the nuclear phaseout. We are left with no coal plants in the pipeline as a reaction to Fukushima accident and Germany’s nuclear phase-out. 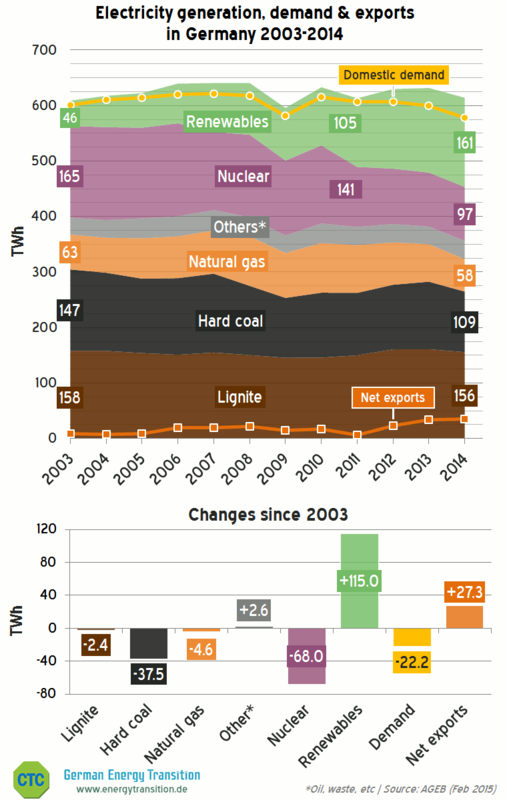 Nor has there been a boom in new coal plants and coal electricity generation in Germany since the Fukushima accident. All of this information is publicly available, but Michael McDonald of OilPrice.com obviously didn’t bother to do proper research. The practice is what I call “drive-by journalism” – a journalist criticizing a subject he is unfamiliar with. He claims that nuclear is to be “fully phased out by 2021” (the date is December 2022), that natural gas is “cheaper per unit of power” than coal (it isn’t in Germany), and that German politicians “are starting to admit” that “coal is the only realistic option” to nuclear (that particular politician quoted here has never said anything else in the past decade). The sad thing for me not only as a journalist, but also as a reader, is that such an article not only gets through the editorial process at OilPrice.com, but then also gets picked up by Time.com without any further review. The plant is running now on fuel costs, selling power for what it costs to generate it. On the daily costs – to be competitive, the investment will never be earned back. I love your analysis of the ‘drive-by-journalism’, the sloppy error-fraught ‘reporting’ that is so common stateside. Basically every politician from the middle to the right is in the lobby-pocket of the nuclear industry and the vested fossil fuel interests such as the ‘Koch Brothers’ and other biased oligarchs. Misinformation and phony research is sponsored by the ‘old order’ who are seeing their (profitable entitlements) their ‘fleeces floating down the river’. The transition to renewables is picking up speed in the US but the cat-calling and asinine allegation of a ‘liberal conspiracy’ is flaring up again. While in Germany no respectable politician would spout junk against scientific data and verifiable statistics rightwing Americans have no shame. For the coming 2016 election another rich crop of global village idiot politicians is already lining up too with ridiculing populist slogans, fear mongering, proposed and passed laws and obstacles favoring ‘the old order’. I’m very glad scientifically keen minds in Germany, China and beyond North America are setting ‘the new tone’. Meanwhile, for the time being, expect to hear more half-baked non-sense from American media catering to fossil blow-hards ridiculing the notion of ‘human-induced-climate-effects’ with snow-balls in the Senate or claiming ‘God would be angry if we didn’t use ALL the fossil fuels he gave us’…. Keep up the good work! Even though Germany is wisely reducing Coal generation as fast as possible, their is still a big demand for Clean”er” Coal generation in many other Countries what must burn coal for one reason or another, German Industry would be wise to partner with these Countries to help them create as little pollution as possible since we all live on the Earth and share the same Air; until they can shift to Solar (of all flavors). And then France got it, now the French PV is cheaper than the French atomic Power. Europe’s largest PV-power plant is now constructed, 300MW will be ready in October. The next place atomic power plant in Blayes is trying since a year to install a new replacement steam generator to one of its reactors …. The Germans (well …) get the 300MW PV power installed within 1 year. And with a guarantee included for decades.Recycling inclusive. Fumes do not mix with tourism, nor does radioactivity. For this problem healthy eating is the solution, a total cut down to zero concerning agricultural subsidies and strict animal welfare and environment controls. This is not what the French population/voters have in mind. As the French article above shows: they prefer to dye in their own shite before making sacrifices on the menu board.